Florida’s Space Coast is full of fun and adventures, so full in fact, it may feel overwhelming to pack in as many attractions and restaurants as you can if you’re only spending a weekend here. However, we’ve planned for you an incredible and fun-filled weekend in Cocoa Beach and Melbourne, that will allow you to focus on making memories and worry less about working out the details. If you’re coming from out of town we recommend flying into Orlando-Melbourne International (MLB), which will put you right at the doorstep of everything on Florida’s Space Coast. 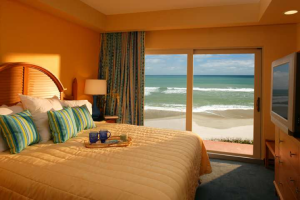 But no matter how you get here, you’ll need to find one of the many Space Coast Hotels – and there are plenty of options to choose from. From cozy bed and breakfasts to large hotel chains and oceanfront resorts, you’ll be sure to find somewhere that accommodates your budget and taste. A day in Cocoa Beach is all about fun in the sun, so you’ll want to start out with a hearty breakfast from Barrier Jacks. Their delicious potatoes, omelets and fluffy pancakes will be sure to fill you up before a long and exciting day. 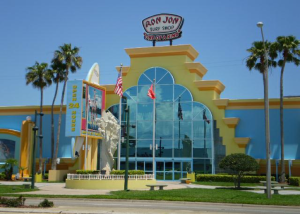 You’ll also want to make sure you have everything you need before hitting the surf, so be sure to explore the iconic Ron Jon Surf Shop, the world’s largest surf shop, to grab last-minute necessities or even a souvenir or two. They even have rentals available, so if you’re looking for sand toys and beach chairs to rent, look no further. Once you’ve got your sunscreen, chairs, towels and boogie boards, it’s time to head to the beach. Relax, soak up the sun and don’t hesitate to rent yourself a foam surf board and learn how to ride the waves. 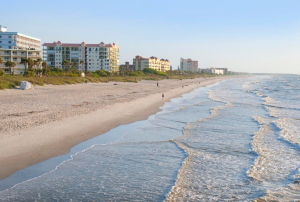 The waves on Cocoa Beach are smooth and consistent – perfect for first timers. 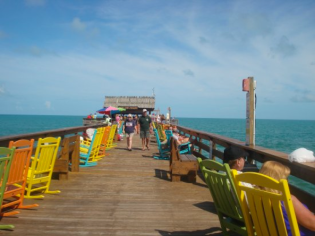 Head down to the historic Westgate Cocoa Beach Pier, which is always buzzing with locals and visitors. Enjoy this prime fishing location, explore the shops and listen to live entertainment all while taking in the beautiful views of Cocoa Beach. 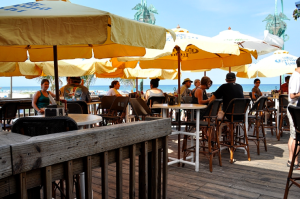 When you start to get hungry, you can grab something from one of the restaurants on the pier or head to Coconuts on the Beach, to grab a drink and some food. 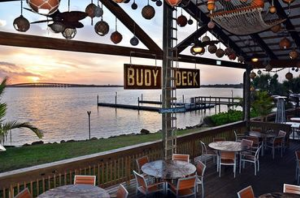 Walk right onto their outdoor deck – sandy toes and all – and enjoy a delicious seafood meal with a view. 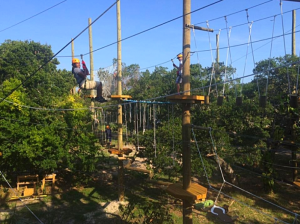 Top off your day with a trip to Cocoa Beach Aerial Adventures, and get your adrenaline pumping as you navigate your way through 50 challenges — all while suspended 45 feet in the air amongst a canopy of 100-year-old oak trees. It’s a unique experience you won’t want to miss. Once you’re grounded, head over to the award-winning Heidelberg Restaurant for some delicious steak, seafood and continental cuisine, and then head next door to Heidi’s Jazz Club to truly end your day on a high note, with the smooth stylings of local jazz musicians. 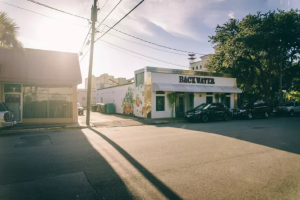 Start your day off with a delicious breakfast from Backwater, a small mom and pop breakfast/lunch café in the downtown area. Backwater has incredible food, friendly service, and their tables have built-in griddles so you can even enjoy do-it-yourself pancakes. Afterwards, you can spend a couple hours exploring the vibrant shops in Historic Downtown Melbourne and find some one-of-a-kind items and gifts to take home with you. 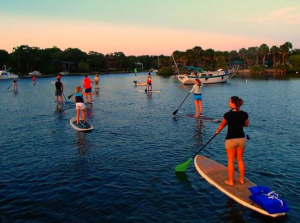 Once you’ve had your fill of pancakes and shopping, you can spend the afternoon on the water when you rent a paddle board or kayak. Take an eco-tour or venture out on your own and try to spot manatees, dolphins and more. And when you return to land, you can grab lunch at Grill’s Riverside. 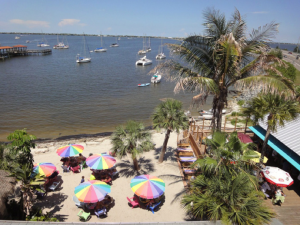 Enjoy waterfront views at their outdoor Tiki bar as well as delicious seafood. 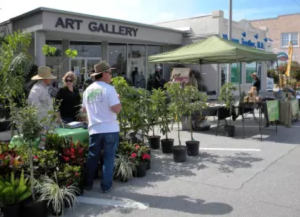 Afterwards, head to the Eau Gallie Arts District (EGAD) which is home to beautiful wall murals, art galleries and museums including the Foosaner Art Museum. In this lively district, you can take time to stroll and enjoy the sights and sounds of Melbourne as the sun begins to set. Finally, head to Squid Lips Overwater Grill for dinner and drinks. Featuring the famous Shark Bar and Beach — along with delicious seafood and specialty drinks, Squid Lips is a favorite among locals and visitors alike. Monday: As you travel back home today, it may be time to start planning your next trip to Florida’s Space Coast. After a whirlwind of a weekend, there’s still so much more to see and explore here.